When it comes to burgers, there’s no state that does it better than California. From classic fast food to steakhouse staples and even inventing new toppings, there is a burger option for everyone. Here are the 10 best spots to grab a juicy burger in the Golden State. California is crazy about chili burgers and there’s no better place to get your fix than the Original Tommy’s. Tommy’s now has locations through California and even Nevada, but the first spot on Rampart is where to go for a juicy, messy bite. Don’t forget to get plenty of napkins and the hot peppers on the side. There may not be a more quintessential spot than an In-N-Out burger. These old-school style fast food joints still make a great hangout for high school kids. Lines reach around the block for people looking to score their secret menu goodies—like animal style fries on the side. If you like a double decker deal, then Bob’s Big Boy is the place to be. From the iconic character to the fun waitresses and plenty of kitsch, there’s nothing better than sitting down to a Big Boy Combo after landing at the nearby airport. It also makes for great celebrity spotting, thanks to the close by studios. Pasadena claims to be the birthplace of the cheeseburger. The spot known for the creation is no longer around, but you can get an approximation at Pie N’ Burger, a local secret that is poorly kept. As one of the oldest restaurants in the city, the burger or cheeseburger of your choice is made the old-fashioned way and filled with yum. The Apple Pan has been dubbed the best burger in the nation and the historic spot has featured on a variety of local and national lists. The counter service, delicious juicy burgers and the sense of delight make it a top spot to grab a bite. Go for the famous Hickory burger. Hodad’s has a few locations in the San Diego area, making it possible to grab a burger anywhere you go. The surfer culture focused spot is on its third generation and doesn’t look to be giving up serving great burgers any time soon. 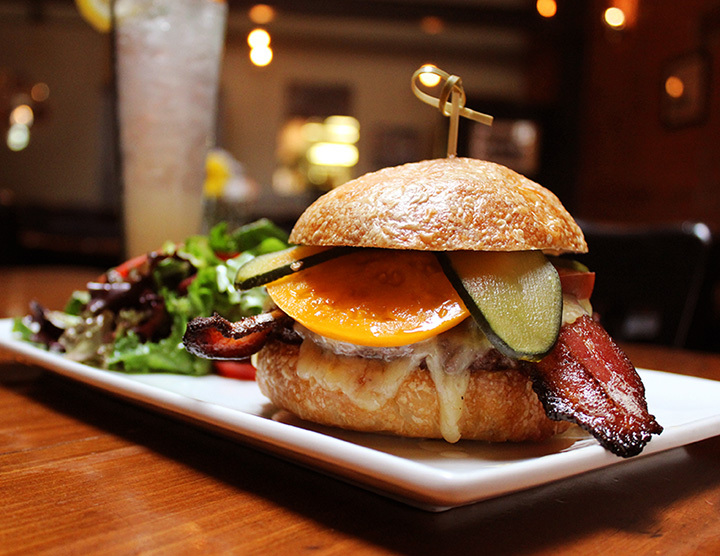 Zuni Café is best known for their grilled chicken, but anything that make in the wood-fired oven comes out delicious, including a burger. Served on focaccia, the burger is anything but boring. Father’s Office is renowned for a vast selection of gourmet burgers. Pair your choice with a local brew and one of the best gastropub experiences in the state is yours to enjoy. Featured on “Diners, Drive-Ins, and Dives,” Squeeze Burger offers a “cheese skirt” on your cheeseburger, making the cheese layer even better with fried slice of cheese that hangs off the burger. Gar Woods offers scenic views with your burger. Much more than just a burger joint, the burgers are a menu favorite, thanks to the handcrafted care that goes into each patty.